Tuesday, June 18, 10 to 11 a.m.
Tuesday, July 23, 10 to 11 a.m. The Journey to Well-Being is an intentional walking program, designed to aid participants in experiencing the calming, restorative powers of nature. 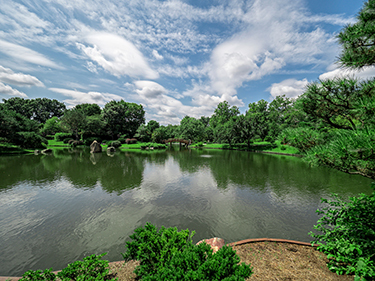 The Japanese Garden serves as a peaceful setting for people to explore their relationship with nature and with themselves.This 10-week program consists of three facilitated meetings, including a guided tour of the Japanese Garden. The remaining weeks consist of seven self-guided walks, inspired by themes related to natural elements such as wind, stone, and sky. The walks can be completed at the participants' own schedule and pace. Participants will receive a guidebook which provides suggested pauses for each walk, intended to increase awareness and encourage time for reflection. Non-members will receive seven garden admission passes in order to complete the walks. Designed for adults only. Registration ends May 13 at noon. Experience the serenity of the Japanese Garden.